Tesla rallied Tuesday morning after a judge approved CEO Elon Musk’s settlement over a fraud charge. The Securities and Exchange Commission sued Musk last month over allegations that he committed fraud when he said he had “funding secured” to take Tesla private. 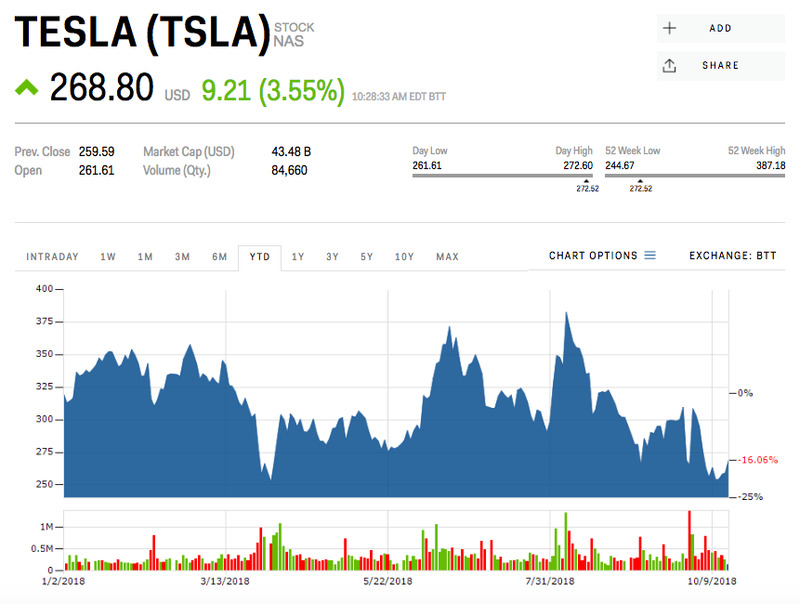 Tesla rallied as much as 5% Tuesday morning after a judge approved CEO Elon Musk’s settlement over a fraud charge with the Securities and Exchange Commission. The SEC sued Musk, accusing him of making “false and misleading statements” in tweets on August 7 claiming he had “funding secured” to take the electric-car maker private at $US420 a share. The SEC said Musk knew he had no such deal and accused him of knowingly misleading the public. Musk settled with the SEC two days after the charge, neither admitting nor denying the allegations while agreeing to step down as chairman for at least three years. Both Musk and Tesla will also pay $US20 million fines. Musk and the SEC had filed a joint letter last Wednesday saying their settlement would be in the best interests of investors. While Tuesday’s rally is good news for Tesla shareholders, all eyes are now on Tesla’s third-quarter earnings report, expected at the end of October. The electric-car maker recently topped Wall Street’s estimates for third-quarter deliveries, but it’s unclear if that will translate to the company becoming profitable, as Musk has said will happen this year. “Tough positive, we don’t have conviction that [delivery report] is sufficient for Tesla to achieve its GAAP profitability target for Q3,” George Galliers, an analyst at Evercore ISI, said in a note to clients following the release of the company’s September deliveries. Wall Street analysts surveyed by Bloomberg are expecting an adjusted loss of $US0.11 per share, a significant improvement from the previous quarter, and have an average price target of $US303 – about 13% above where shares are currently trading. Tesla shares have plunged 30% from their August 7 high – when the go-private saga began.